Fr. Lovitsch began college at Indiana University studying at the Kelly School of Business, but moved on to Wheaton College. During his junior year of college at Wheaton, he attended St. John Vianney College Seminary in St. Paul, Minnesota after being accepted as a diocesan seminarian for the Diocese of Joliet, IL. Studies began shortly thereafter at the North American College in Rome. After completing his first academic year in Rome, Fr. John lived with the Coptic Catholic Seminarians in Egypt to teach them English. It was there where he says he was able to "see and experience the full breadth of the life of the Church in another country where the members are suppressed and struggling under oppression." 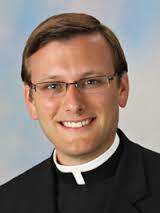 Two years hence he was on assignment as a seminarian at Sacred Heart parish in Lombard, IL. There he grew to love the diocese and the diocesan priesthood. He was ordained a deacon in the summer of 2012 and received priesthood from His Excellency R. Daniel Conlon, Bishop of the Diocese of Joliet, IL on May 18, 2013.